I've always loved books and movies about Core Four groups solving mysteries. Why is four the magic number? Who knows. But it worked in Scooby Doo, the Enid Blyton books, and on the teen drama Riverdale. 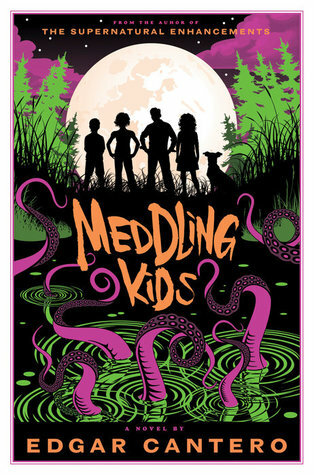 Meddling Kids by Edgar Cantero is a throwback to those classic quartets. In an interesting twist, Cantero looks at life after the four 'meddling kids' grow up. The book starts with what life has thrown at the four main characters: Andy, Kerri, Peter, Nate - and Tim, Andy's dog. Andy, short for Andrea, was the tomboy. She tries to hide (not very successfully) her crush for Kerri, the brains of the group who is now bartending. Peter, the handsome one, is dead. Except Nate still sees Peter, talks to him all the time. For that reason, Nate has committed himself to Arkham Asylum. The action starts when Andy confronts Thomas Wickley, who was arrested when the Meddling Kids solved The Sleepy Lake Mystery. As in a very popular Saturday morning cartoon, Wickley dressed up as a monster and was apprehended by the Core Four. Now, however, Andy is wondering if they nabbed the wrong person. She goes to find Kerri, her old crush, and together they break Nate out of the asylum using the 'Reverse Wolfman Trap.' Like many scenes in the book, this is filled with exciting action as the three friends (along with Peter, who might be a ghost or just a figment of Nate's imagination) work together. Once the group is back together, they return to Blyton Hills to re-investigate the mystery. There they reconnect with Captain Al and other odd figures from the childhood, all while they are based in Kerri's old home. Cantero determinedly breaks fourth, fifth, and sixth walls in Meddling Kids. Some of the dialogue is written as a script, and at one point Nate looks back several lines to see what someone has said. I'm not a fan of self-aware writing, but Cantero goes too determinedly cutesy. For me it worked. Perhaps it's due to his brilliant and original imagery, such as when Tim (the dog) 'curled up in a corner of the backseat, sheltering his penguin from the storm, all tensed up in “scandalized Maggie Smith” pose. He can call to mind a scene with one line of description: 'They checked into a motel not uglier than the rest, which is remarkable, road motels being relentlessly competitive when it comes to creating the most depressing atmosphere out of blank walls and PVC." I really enjoyed Meddling Kids. If you like adventure and excitement, this is a great book to sample and, if you like the style, read on a winter vacation. Currently, she wrestles words and laundry in New Jersey.